MonkeyLearn makes it easy to process your data within Google Sheets. You simply select the data you want to analyze and then select the model you want to work with from your MonkeyLearn account. Install the extension from the Add-On page. Google will ask you for the required permissions to be able to run the add-on with your Google account. 2. 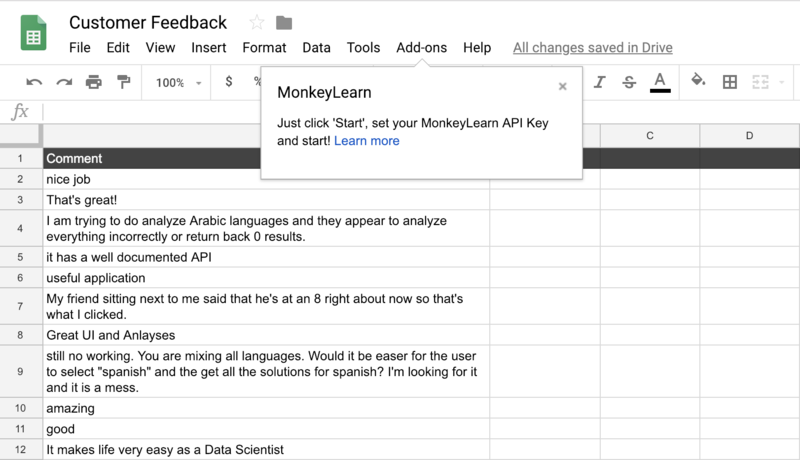 Copy your API Key from your MonkeyLearn account, and then go to the "Add-ons" menu item in Google Sheets, then to "MonkeyLearn > Start". 3. When the MonkeyLearn tab loads up on the right side (as shown below), paste your API Key into the "Set API Key" field and click "Set". 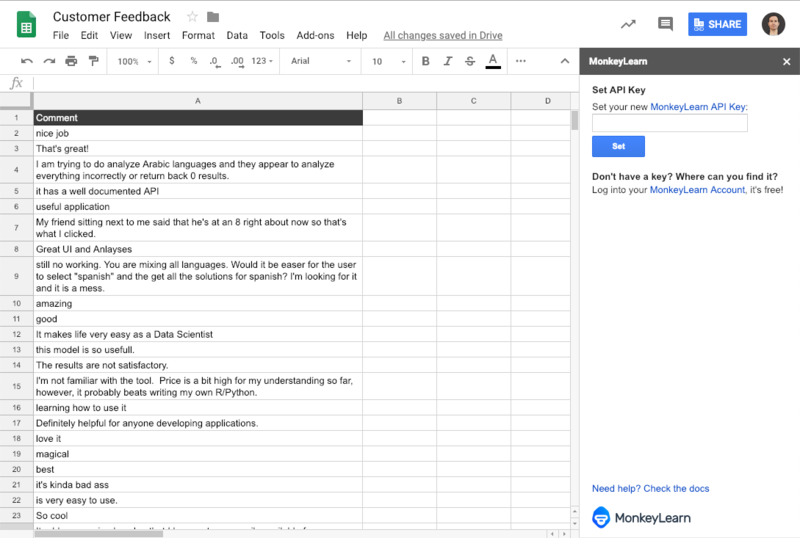 That will connect Google Sheets with your MonkeyLearn account. 4. Finally, select the data you wish to analyze in the spreadsheet and then select the model you wish to use from the dropdown menu in MonkeyLearn tab. Click "Run" to process the data you selected, the results will be shown in a new column to the right. Under Advanced Settings you can toggle options to compact results to one cell, to include confidence levels, to use production level model (for custom models), or to output results to a different row or cell. 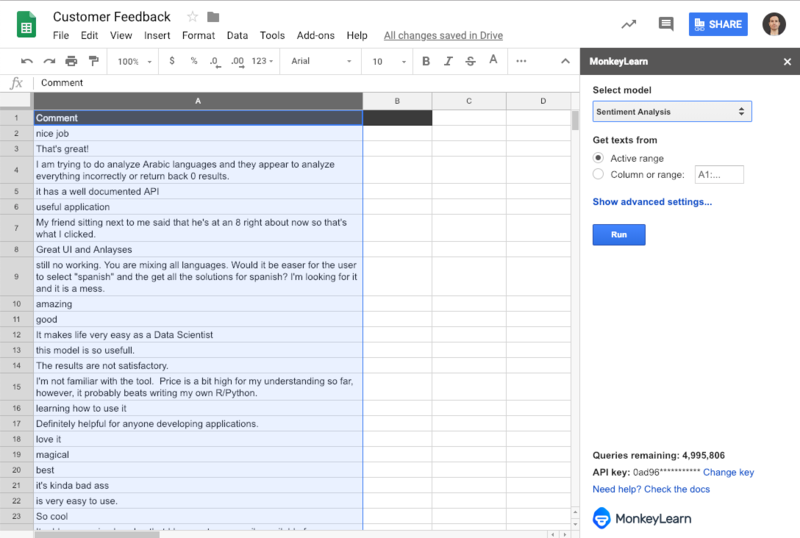 Using the MonkeyLearn Google Sheets extension is also a great way to analyze text with multiple models, as each time you run an analysis the outputs will populate to a new column.